Following up the phenomenal success of her headline-making New York Times bestseller I Hate Everyone...Starting With Me, the unstoppable Joan Rivers is at it again. When her daughter Melissa gives her a diary for Christmas, at first Joan is horrified—who the hell does Melissa think she is? That fat pig, Bridget Jones? But as Joan, being both beautiful and introspective, begins to record her day-to-day musings, she realizes she has a lot to say. About everything. And everyone, God help them. This is the Diary of a Mad Diva. Forget about Anais Nin, Anne Frank, and that whiner Sylvia Plath. For the first time in a century, a diary by someone that’s actually worth reading. 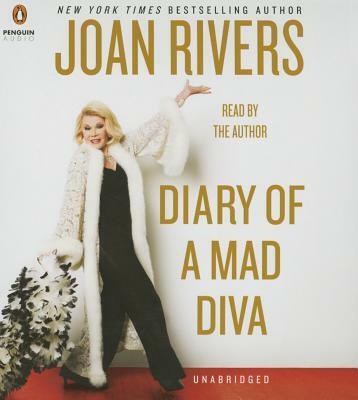 Comedienne, Emmy Award–winning TV host, Tony-nominated actress and CEO, Joan Rivers was an icon of American culture, a bestselling author, Celebrity Apprentice winner, writer, producer, director, and savvy businesswoman who overcame great odds to reinvent herself time and time again. She hosted E! Network’s popular series Fashion Police, and starred with her daughter, Melissa, in their own weekly reality show, Joan and Melissa: Joan Knows Best? on WEtv Network. Her critically acclaimed documentary, Joan Rivers: A Piece of Work premiered in theaters nationwide and is available on DVD. Amongst all of her success, Joan’s most joyous triumph was being a mother and grandmother.